Spicy and exotic with notes of lemongrass, apple, and ginger, what makes Bleu Ginger distinct is its dramatic bright blue hue. 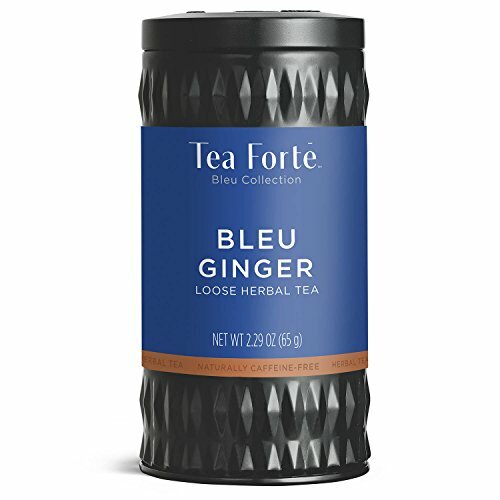 BLEU Ginger is part of Tea Forte's BLEU collection, a sustainably-sourced family of all natural herbal blue teas with no artificial colors or flavors. The striking visual presence of each BLEU tea is matched by an herbal symphony of taste. What gives this tea its vibrant color is the butterfly pea (or blue pea) flower, a prized species native to Southeast Asia and often used in traditional cuisine. The butterfly pea flower is a vining plant that comes in shades of white, purple, and of course, blue. BLEU Ginger is a naturally caffeine-free and its ingredients include ginger, lemongrass, apple, and butterfly pea flower. All herbal teas are properly referred to as "tisanes" or infusions, crafted from dried herbs, flowers, leaves, roots, seeds and fruit. Like tea, herbal infusions have been consumed for centuries as healing tonics to lift the spirit and enhance well-being. Tea Forte's herbal blends, including this butterfly pea tea, are hand-crafted with artisan care and a vast knowledge of how the antioxidant properties and therapeutic applications of pure, fresh herbs, flowers, and botanicals, deliver delicious healthful infusions that can delight both mind and body. STEEPING INSTRUCTIONS: place tea leaves in an infuser basket or cup and pour hot water over the leaves, steep for 5-7 minutes and enjoy! Thai Tea Suwirun ,Lemongrass Tea Organic Product Of Thailand.